On the internet and media today you can see people that prepare for accidents and disasters in nature. I have mentioned many times before that survival will most likely happen suddenly or by accident. This will be in areas in or around populated areas. Some will be rivers and lakes or the sea around where people live. Most accidents that results in death are in areas I have explained above and not in the wilderness at all. The areas I have explained above can be deadly. It can be fire, extreme weather, terror, cold water, at night or a number of other factors. To be prepared is not about exaggeration or over doing philosophies because it is a known fact that people die from situations and from what is many times a trivial situation that could easily be overcome by a SAK. What are the main factors that must be considered and what do you need? Basically the tools you need for survival or the factors involved are not so different from the wilderness. The SAK is just one tool that makes things safer for people in or around populated areas. When you are in a boat you will need knife/tools, light and something to make fire with. Besides these you need to use common sense and use a life west of some kind. If you look on what people die from then many will be surprised. If you fall through the ice and cannot get up then you scream for help. It can be smart to have a device or tool that can make sound like a small whistle. The light you can use to send signals with for example SOS. The knife can be helpful to get up from the ice as well. It is absolutely not necessary to die from such situations. On the water if you are into sports or kayaking then you must take some extra precautions. Just to paddle in the summertime can be demanding because of waves, current and sudden change in weather. Sudden changes in weather can be because of environmental changes that makes even the experienced person unsecure and situation unpredictable. One of the main factors that make survival unpredictable for people is the comfort they are used to. People use boats the year around and that is important to remember. People are used to comfort and that things never goes wrong. This is most dangerous factor in my mind. Today people use mobile phones and this is a very helpful and smart tool to bring. It is also an unpredictable safety device still. Do people really want to drive around in a boat and suddenly come across an accident with a person screaming for help that he is tangled in a net or rope and not having a knife. Some people do not bring a cutting device on the water and that is a big no! It is retarded to say it gently. My webpages are about SAK and things around it. People die from trivial things and I suggest people should wake up a bit. Society got laws and regulations for knives and this is unavoidable. Because of this different belt cutters are developed to be used in public places or as a device to be in a car and so on. I agree that these are helpful devices and some are good products. Its main task is to cut a seat belt in a pulling motion. It got a curve that can only be used for such tasks and it cannot be used to stab with. Ok all well so far. I agree that stabbing with knives is wrong and it is a disgusting idea all together. The problem with these belt cutters is that they are usually small and designed to cut thin materials that many times are flat. It will not be sufficient for rope. The development of laws and regulations are therefore conflicting with what is the best safety device for people. From what I know people are allowed to have knives in cars and so on. This can also include window breakers and so on, this I have talked about before and that people die when cars fall in the water because they simply cannot get out. People get a real hard time breaking the windows from outside as well. On the picture to the right is a Leatherman "strap cutter" that is very well developed. This can be used for a number of different things. It can also cut much more than straps. Because this is one hand opening with lock and the Complete OHT got more cutting blades then it is a good tool with quality. Strap cutters and similar products that are designed for seat belt are very limited in the abilities to cut. They are designed to be pulled with. 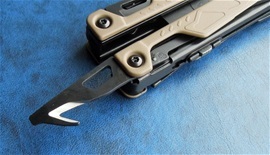 The development of the society makes products alone that are similar to the design of the Leatherman strap cutter and got that guiding angle that ends up in a sharp groove for cutting. Wenger also developed different designs for safety. Together with other cutting devices on a tool then these are very smart to have. Alone they are not sufficient to be called safety tools. This can be because the material you cut is not flat and it can be thick rope or materials. Some of them are just too small and made to be put in a small pocket in a life west. It is just not sufficient on the water. The problem with smaller cutting devices is that they sometimes require time. It takes time to cut the materials. If you have practiced with it then you can do things faster. The problem is that many pulling devices actually requires force to pull with. For older people or if you are injured then this may be difficult. If you have a reason for bringing a knife then you are allowed to have a knife with you. This is a good simple rule. Therefore bring larger cutting devices because it will save time. One hand opening, longer blade and locking mechanisms saves time. Designated rescue blades by Victorinox are perfect blades. The wavy edge and long inward curve cuts extremely controlled and well. Here you got an incredible fixed blade knife from Mora for rope. It will cut rope like nothing. If you only bring this knife for survival it is not sufficient because you need something to do force cuts with on wood. Most of this edge got serrations and only a small section of the tip is plain edge. There is also a very small part on the inner edge towards the handle that is plain. For force cuts in wood you need a plain edge. If the outer section of this blade would have had the plain edge just a bit further in then you would have a combination edge that is better for everything. I would not recommend using the little plain edge towards the tip for force cuts in wood because this may cause injury on the person using it. Some philosophies on combination edges are inner section serrations vice versa. The absolute best for wood is plain edge on the inner section. This Mora is a rope cutter that is very good for such tasks. Serrated edge on wood is not well or comfortable at all. I like both combination edges used on Victorinox and Wenger knives. I prefer a special purpose OH lockable belt cutter/rescue blade and a separate plain edge OH lock blade. It gives a great advantage! The Mora knife is incredible for rope but not sufficient for survival. I recommend this knife anyway because of the serrations. It will cut belts and rope easy. Today you can see many different edge designs and we must also be careful that we enter a world without a sharp tip on a blade. Different special purpose blades are made for cutting belts and for rescue tasks. For survival you must have a blade that got a tip design that is pointy and sharp. This part of the blade will have a big number of uses during survival situations. 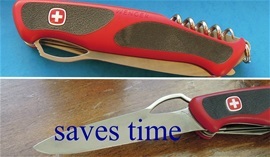 The Swiss Army Knives are no stabbing knives because of the design. They can be used for some light tasks there too(on materials). The tip can see much use for carving and precision tasks. The SAKs many times got the awl that is a perfect puncturing and drilling tool. The concept of a survival knife is a SAK because you can have many different blades in one package. It is not smart to jump corners for survival. I recommend a rescue blade with OH and lock and serrations, a plain edge OH lock blade, wood saw and the awl. Additional screwdrivers are welcome. Pliers are also excellent survival tools.